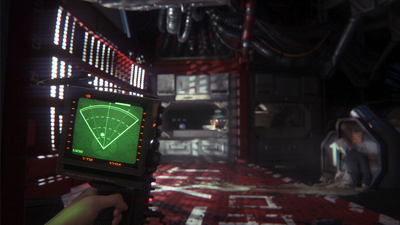 I played Alien: Isolation at the Oculus booth at E3 last week. Alien is a high-end experiment in the genre I’ve been calling “exploratory first-person horror” for the last few years. Mechanically, it’s a lot like Slender or the hiding bits of Amnesia: you are running around a dark space ship with an obfuscated radar, hiding from the deadly alien that is prowling somewhere in the shadows. If the alien catches up to you, it’s an immediate, grisly game over. The presentation is dark and the tension is high and, as exploratory first-person horror games go, this one probably has the best production values of anything I’ve played. It’s a good, tight horror game. But as a VR experience, it’s absolutely jaw-dropping. It’s not that the VR experience is completely convincing. There are a lot of technical problems left to solve. The resolution should be higher, and it’s hard to reconcile the direction that your character should move when you press up on the analog stick (moving the way you are looking felt weird, at least to me). Any time the game took camera control away from me, even for a moment, I started to feel queasy in my stomach. And it’s not clear exactly how this will scale to more complicated games. Because it’s imperfect, the VR version of Alien felt a bit a Disneyland ride to me; a not-entirely-real world that was trying its best to be convincing. But here’s the thing: I was there. The world might be fake, but I was standing in the middle of it. The “sense of presence,” (to use Thomas Grip’s term) is so strong that I quickly forgot about the details of the environment and concentrated on hiding in a tiny ventilation shaft while the flashing dot on my low-tech radar passed dangerously close. With VR, even though the tech and presentation have a lot of room for improvement, the feeling of being inside the world is astounding. And it makes the horror of this kind of game work almost immediately. Grown men and women sitting near me were literally screaming as they played. Speaking of Thomas Grip, I chatted with him at the annual Game Developer’s Conference this year. He’s hard at work on SOMA, which, from the little I’ve seen, is going to be the best horror game available on a console for a long while. One of the things we discussed was the ways in which that sense of presence is built (or, in many cases, destroyed). Sense of presence goes beyond suspension of disbelief; it is the feeling that the world is real, that you are in it, and that the consequences of your actions are therefore meaningful. It’s an incredibly hard feeling to create; most games don’t manage it. Those that do are often horror games, and those horror games are the best horror games. But with VR, the sense of presence is almost free. The world, even when rendered imperfectly, is immediately believable. Though your brain knows that you’re sitting in a chair with a cumbersome mask on, it’s very hard to actually interact with the real world. Even reaching out my hand to pick up a controller from the desk is hard for me to do without closing my eyes. The visuals your brain is getting are strongly sending you the message that you are somewhere else, and the easiest thing to do is just believe that. As I mentioned above, there’s still a lot of technical hurtles. The biggest, I think, is character movement. You can’t very well get up and walk around with a giant screen stuck to your face, but your character in the game needs to move freely. This disconnect between your real movement and the in-game movement is jarring because there’s no such disconnect between your head movement and your view. My biggest beef with Alien is that movement felt unnatural. It wasn’t unplayable, but it hurt the sense of presence. It felt like I was just a disembodied head flying through space. But these issues will be solved. In fact, I’m sure the all-star dream team of developers that Oculus has assembled is hard at work on solving this sort of problem right now. But even at its current state, VR for horror is incredibly compelling. I am tempted to claim that it will be, for the types of games that work in VR, the best possible way to play horror games in the future. Good to see ye back and getting a little time off developing to check out some stuff at the con. I don’t think I’ll subscribe to the oculus for some time after release, but i know a friend who will certainly grab it day 1 so I’ll have a shot at seeing what it can do. Have you heard any word if they’ll even merge the oculous with dolby Atmos? Or Dbox? it would be kool to see games built to work with dbox and oculous.. having the seat shift and move in sync with the headset could REALLY amp up that immersion and sense of presence. Never heard about SOMA! I hope it’ll be great, underwater locations are awesome for sh games (Deep Fear was really nice!). I like the part where you talk about immersion and feeling or belief that you are actually there, out aboard a spaceship with your own two feet. I recently turned off my computer monitor, sat down in the dark, and tuned into a radio show that I found on Youtube called “Pontypool Changes Everything” which is essentially the broadcast of a radio station in the zombie apocalypse. What’s interesting about the idea of a radio broadcast is that it casts its fictional world onto the negative space of reality through the power of suggestion. While you listen in, you imagine that radio station being out there somewhere and outside the windows of your house you imagine zombies walking the streets and swarming around cars. I actually got up and locked my house door. I wasn’t pressing buttons on a controller, but in complete control of my whole body in front of a world that was very real. There’s a whole new level of terror when the fear comes out of the TV screen and into reality, even if only in your imagination. I really hope this is something we see more of in the future. I haven’t had the opportunity to try any form of VR, even the older forms before Oculus. I’ve wanted to for a long time, and especially for survival horror, as I suspected that it would benefit greatly from the sense of immersion and I’m glad to hear that that is the case. The only thing that worries me is the motion sickness. I’m one of those people who gets sick from playing certain FPS games, so my fear is that I’d never be able to play a VR game for more than a minute. Perhaps when it has been fine tuned and all of the issues have been sorted out with visuals and movement it will be less of a problem. Or maybe I’ll have to pop some motion sickness pills before putting on the device. Great to see another post! Been interested in VR for sometime now – would love to play through Among the Sleep again with a Rift.